A guide to uploading files to GoldFynch. 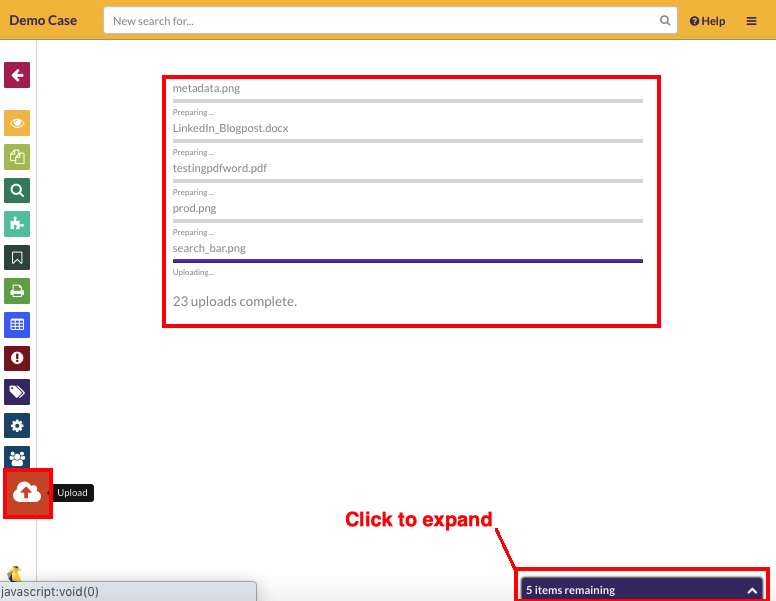 To access your case files on GoldFynch, they first need to be uploaded to the platform. Below are the steps to do so through your web browser. GoldFynch allows for files to be uploaded via drag-and-drop or manual selection. Choose a case and click on the Files button in the left pane. Navigate to the folder that you want to upload the files to. Note: To upload the files to a new folder, you can create one by clicking on the +New Folder button. Then click on the folder to open it. This is where your files will upload to. The easiest way to upload files is by dragging-and-dropping them directly onto the ‘Files’ view in GoldFynch. When using drag-and-drop, copies of the files are created on the GoldFynch server and the files on your computer remain intact and untouched. 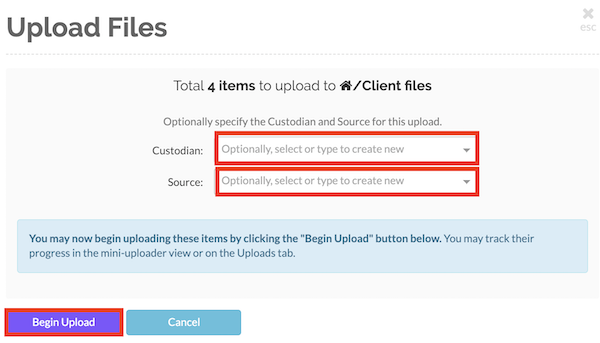 Click on the Upload Files button instead and choose specific files to upload. Note: You cannot upload files across multiple folders. Instead, either navigate into the folders and upload the files separately, or zip the containing folder, and upload the zip file. GoldFynch automatically upnzips files and maintains the folder structure. The status of your uploads can be tracked from the ‘Uploads’ view, the uploads button in the left pane, and the uploads pop-up bar in the bottom right corner of the screen. Click on the top bar of the pop-up bar to open or close it. Note: After a file has been uploaded, it is processed by GoldFynch. This is shown in the ‘Files’ view. Note that you may have to refresh your browser window for the files to be displayed. 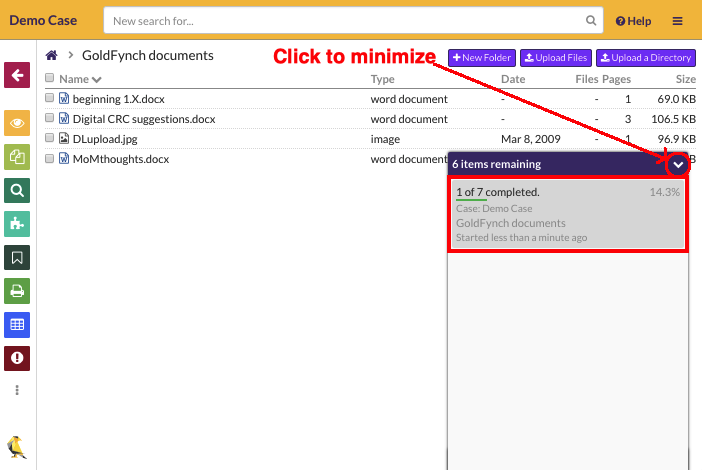 GoldFynch handles them all: zipped files, PDFs, word documents, emails (PST, MBOX), etc. Zipped files are unzipped - even zips within zips! Tip: If you compress multiple files (folders, sub-folders, and even whole directories) into one zip file, then you’ll need just one drag-and-drop to upload them. And GoldFynch unzips them to the same folders and sub-folders in which they started. GoldFynch can also requisition additional processors for you that speed up the processing rate of your uploaded files.